The first jolt felt like a semi-truck had run into my house at full speed. 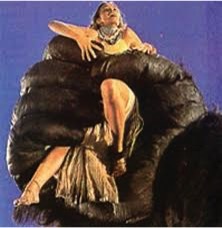 The second jolt made me feel like Jessica Lange being tossed like a salad by King Kong. I jumped out of bed (in all my naked glory) and proceeded to run back and forth across my bedroom floor as if I was auditioning for the role of Chicken Little. When I realized it was an earthquake…a big one, I threw my bathrobe on and ducked beneath my table (the sturdiest thing I owned at the time) while all my earthly possessions fell off shelves. All the earthquake drills in elementary school paid off. “Stop, Drop, Tuck and Roll,” was my mantra. Tuck your head under your arms and elbows. Roll??? Oh wait a minute, was that what we’re supposed to do in case of a fire? 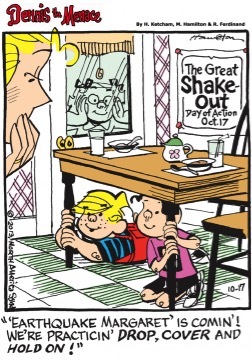 I imagined that it was all my teacher could do to instruct us sugar frenzied eight-year-olds to stop, drop, and tuck/duck beneath our desks…maybe she forgot? I desperately tried to recall as I hyperventilated in a strange fetal position. Am I to roll with the punches? Roll down a crack in the earth if the earthquake is that bad? Or, while waiting for the earthquake to stop, roll the movie of my life before my eyes? That made sense to me, so that’s what I did. In a flash, because I thought I could exit the planet in any moment, I saw in a slideshow montage, all the people I’d ever loved, all past relationships, all high and all low moments, including unfinished business and people with whom I needed to make amends. Once I was done with my life-review mind movie I contemplated what I wanted my last thoughts to be? But, how do I shift from terror to triumph on a dime? But, that’s not the version that popped into my mind. That newly rephrased version struck a chord with me and sent a seismic inner earthquake of deep peace and calm right through my center. 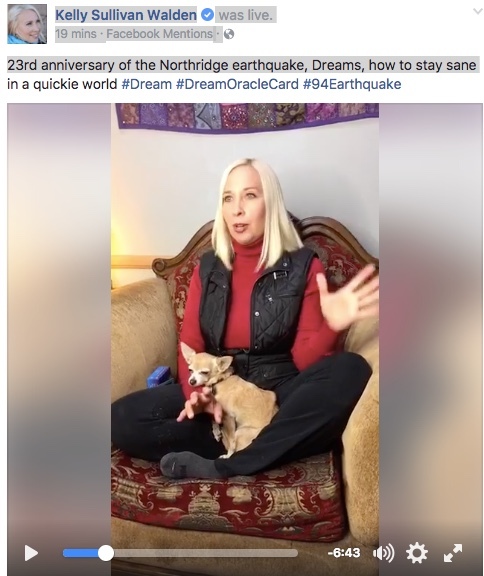 I became flooded with a deep peace-which was bizarre to me-because if there ever was a socially appropriate time to freak out and stay freaked out, it would be in the midst of, what I later found out to be, a 6.5 earthquake. In fact, as I write this, it is the 23rd anniversary of this (Northridge, California) earthquake! However, what struck me most about this experience-and clearly it struck a chord, because I’m remembering it as clear as the day it happened 23 years later-wasn’t the fact that I didn’t die, nor enormous gratitude when King Kong stopped thrashing my house hither and yon. What struck me most was that I personally experienced (for the first time in my life) that it was possible to experience deep peace in the midst of an earth-rocking (literally) calamity. As you know, if you’ve been following me lately, I’ve been on a kick to begin my day by remembering I am “enough”…as opposed to the auto-pilot default mode of hurry up and race to get my endless to-do list complete, feeling ten steps behind the 8 ball before I even begin my day. This reminds me that there is a higher power/energy that governs the universe. What if, in fact, it isn’t me that is creating my breath, blood flow, and organ function. What if it isn’t me that causes the world to spin on its axis, the sun to shine, and planets to dance through space in the intricate way they’ve been doing for millennia? What if that same creative intelligence that governs the universe has my back? What if it is my “shepherd” provides guiderails to keep me from meandering too far off my sacred path. This implies I have what I need. This implies my life is enough. This implies there’s nothing inherently wrong, broken, or missing…regardless of the temporary appearance of my self-imposed measuring sticks. Drop into some deep breaths. Tuck my head to my heart and let my heart do the thinking. Can you believe that we’re already mid-way through the first month of 2017? I’m shocked…and I guess I should be grateful that the time is flying like it is. I have a feeling I’ll be saying that a lot this year. Because time is flying (or flies are timing, however you prefer to phrase it) I want to make sure that you SAVE THE DATE and have plenty of time to do so! My dear friend, Wendy Capland, and Iare planning an incredible 5th annual Shero Intensive for women who are dreaming about a bolder future for themselves and are ready to start. We CAN’T WAIT to see you there! 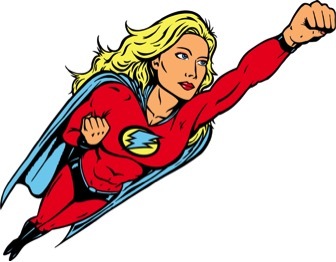 Here’s to your most extraordinary Shero dreams all coming true!